A little sweet, a little spicy, and loaded with flavor! Last week we had our first real fall weather. As soon as the weather changes I start day dreaming about all of the cozy warm dinners I can make. I love fall and winter comfort food. It’s my favorite to eat and my favorite to cook! Of course now that I am getting around to posting this, it is in the 80’s here! These short ribs are pretty simple to prepare, but they do require plenty of time. There is something about cooking something slow, low, and long that I love. It’s as if I accomplished some great achievement because I turned a relatively cheap, tough cut of meat into something so tender and flavorful. I always have to pat myself on the back a little when I do this. Even though it’s not hard and really anyone can do it, somehow I think I’m some sort of culinary genius when I do it. I don’t eat much red meat, but I would always choose tender slow braised beef over a steak on the grill. Guess I’m a cheap date that way. I have made short ribs many times, but usually I do them braised in red wine like in my Short Rib Stroganoff (SO YUMMY!). This flavor profile is totally different, but still so delicious. These babies are braised in mirin, beer, rice vinegar and soy sauce with garlic and ginger. 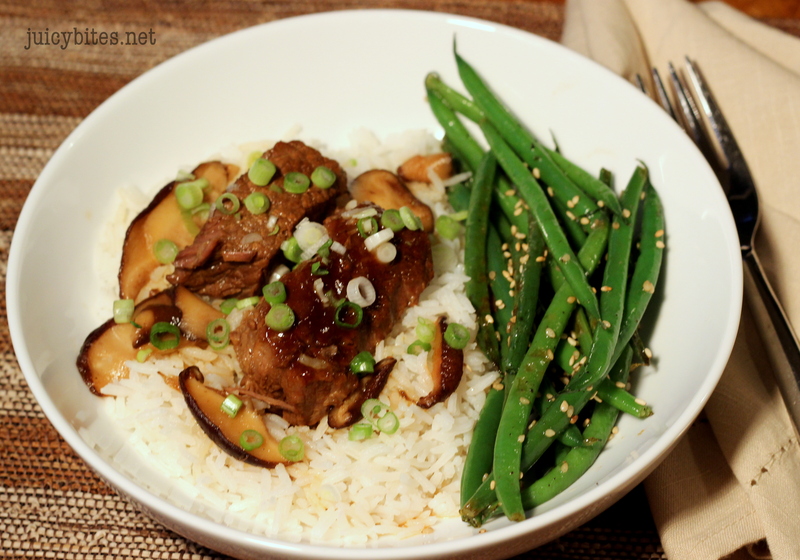 I like serving them over Batsmati rice with some sesame green beans or snow peas. 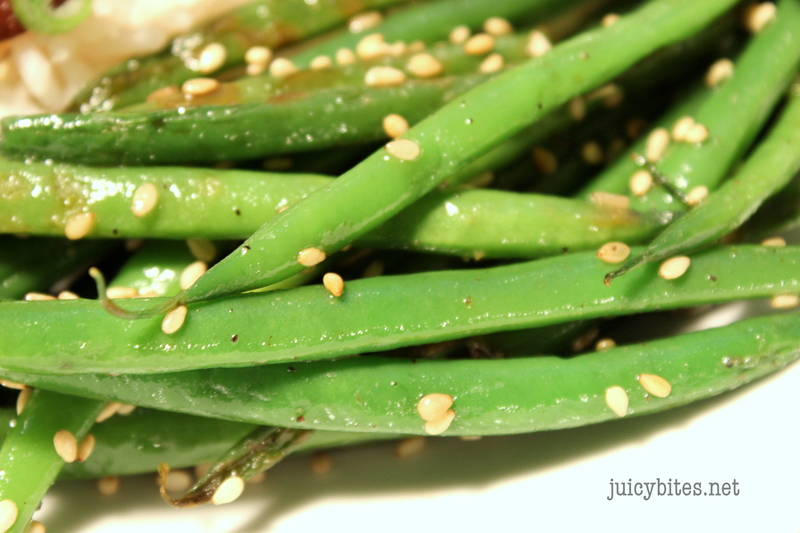 The green beans are super easy. Just blanch some trimmed french green beans in boiling water for about 2 minutes, shock in some ice water for a few minutes, then drain. Pat them dry and saute them in a hot pan with a little sesame oil. Top with salt, pepper, and some sesame seeds. Even Mr. Picky likes these! 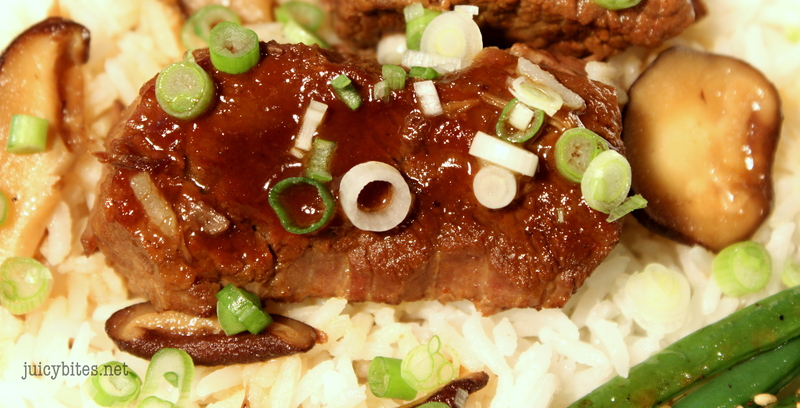 I actually had my first “Asian-y” short ribs at my 40th birthday party and they were prepared by the AWESOME caterer that I had (Amy from Delish Dish for you Orange County peeps). They were just dreamy and I was trying to duplicate them. These got close, but I may need Amy back in my kitchen to make hers again soon. I adapted this recipe from one I found on the Food Network by Dave Lieberman. I made a couple changes, like adding the mushrooms. They add something that I really like, but I wouldn’t be heart broken if you wanted to leave them out and save yourself a step. While this recipe does take a LONG time to cook, the hands on time is relatively short and it is so worth it! In fact, I bet you could throw it all in the slow cooker after browning the meat and it would be great. I just never think quite that far ahead! There are just a few important tips that you want to follow when you cook meat like this. Once you get them down, you can be creative with the flavors. You need a good Dutch Oven for braising. I love Le Creuset, it’s beautiful and functional! You need something that is heavy for even heat and heat retention and you need a tight fitting lid. It should also be able to go from the stove top directly to the oven. Enameled cast iron is really your best bet. Make sure you brown the meat first over medium high heat. This is an important part of getting the end result. Even if you use your slow cooker, brown your meat first. You will want to do this in batches so you don’t over crowd your pot or pan, and make sure your meat is well seasoned with salt and pepper before browning. You want that nice “crust” to form when you brown. Think of it as the flavor sealer! Make sure you have the right amount of liquid. Whether it is wine, beer, or stock, you need enough so that whatever you are cooking is getting a nice little bath. Not completely covered, but enough to keep it moist. With a stew you want more liquid, with a braise it’s less. TIME! You need a good 2-3 hours to properly braise a tough cut of meat. Keep the temp low and even, and keep the lid on. You can do it on your stove or in the oven, but just make sure it stays at a simmer and not a boil. *Note on short ribs: You can use short ribs with the bone in, just increase the amount to 3 or 3 1/2 pounds. Short ribs with the bone are even more tender and delicious when braised, but they have a lot more fat on them than the trimmed, boneless short ribs. You will also end up with a lot more fat in your braising liquid that you will use as a sauce, so make sure you skim some of that off. Return the pot to the stove, lower the heat to medium and saute the garlic and ginger for about 3 minutes. Add the ribs back to the pot. Deglaze the pan with the mirin. Add the beer, the vinegar, and the soy sauce. Stir and then cover and simmer on low for 2 1/2 hours. Check the meat every 20 min or so to make sure they are cooking at a simmer. Once the short ribs are close to being done, saute the shitake mushrooms in a frying pan in a couple tablespoons of vegetable oil for about 5 minutes or until tender. Remove the ribs from the cooking liquid and strain the liquid through a fine mesh strainer. If there is a lot of fat rising to the top, skim some of it off and return it to the Dutch oven. Add the cooked mushrooms to the Dutch oven along with the short ribs. Combine the hoisin sauce and Saracha in a small bowl and pour over the ribs, move the pot to the oven, and cook, uncovered, for 30 minutes. 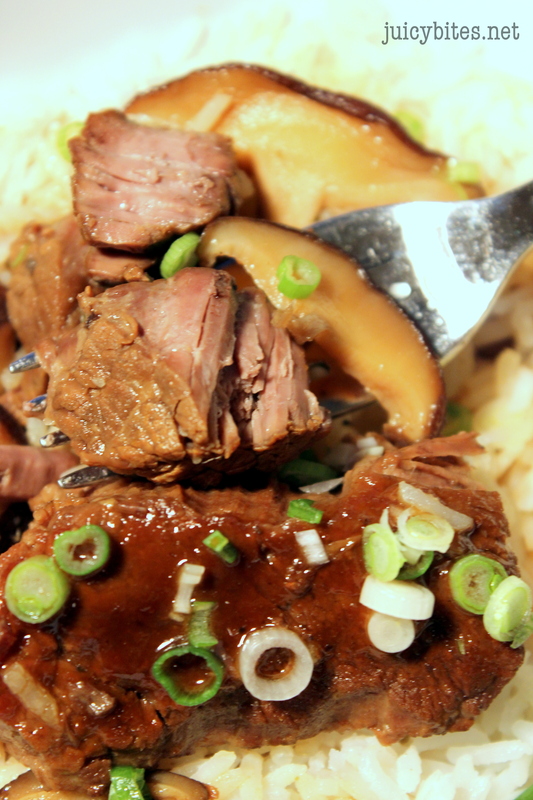 Serve in a bowl over rice with some of the braising liquid and garnish with the chopped scallions.